Dato' Ikmal Hijaz bin Hashim was appointed to the Board of EPMB on 5 May 2009. He holds an M.Phil in Land Management from University of Reading, UK and Bachelor of Arts (Honours) from University of Malaya. Dato' Ikmal began his career in the Administrative and Diplomatic Service of the Government of Malaysia in 1976. In late 1991, he left the government services and joined United Engineers (Malaysia) Berhad as General Manager of Malaysia-Singapore Second Crossing project. In 1993, he became the Chief Operating Officer of Projek Lebuhraya Utara-Selatan Berhad ("PLUS") and in 1995 hewas promoted as the company's Managing Director. In 1999, he then was appointed as the Managing Director of Prolink Development Sdn Bhd ("Prolink") and concurrently assumed the position of President for the Property Division of the Group. He was subsequently appointed as Managing Director of Renong Berhad from 2002 until 2003. 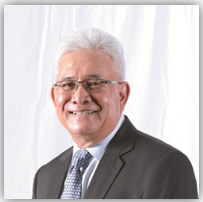 In November 2003, Dato' Ikmal was seconded to Pos Malaysia Berhad as the Chief Executive Officer/Managing Director as well as the Group Managing Director of Pos Malaysia and Services Holdings Berhad. Then in November 2007, he was appointed as Chief Executive of Iskandar Regional Development Authority ("IRDA") until February 2009. He then become the Chairman of Faber Group Berhad from 1 March 2009 until June 2014. During the said period he too was also appointed as Independent Non-Executive Director of UEM Land Berhad. Currently, Dato' Ikmal's other directorships in public companies include Nadayu Properties Berhad, MB World Group Berhad and Kumpulan Perangsang Selangor Berhad. Dato' Ikmal is also a member of the Audit Committee, Nomination Committee and Remuneration Committee.